My ten-year-old daughter wrote and placed this jewel on our refrigerator one day, teaching us that insight, written down and shared in a public location, provides focus to people whose activities regularly involve refrigerators and sticky notes. Wisdom known to a child should be second nature to adults, right? It’s been our experience, however, that few small business owners have put pen to paper and shared their goals for their company! In our recent series of articles on The Growth Curve, we delved into what leads to disengaged employees, a phenomenon present in nearly 50% of the American workforce. Knowing what to work on has direct impact on each employee, both in terms of the contribution each employee can make, and therefore in their engagement with their job. Written and shared goals are a powerful step in the right direction for your business. Goals should look at where the owner or leadership team wants the business to be in three to five years. They should be short and inspirational. “Double in size” is one we often see. It gives purpose to a lot of the little things teams have to think about, knowing the plan is to grow pretty significantly in just a few years. Goals guide you, but they’re not static. That’s because conditions change and progress is made. It may be that you can’t double in size every three to five years, or that you no longer want to become that big. You’ll want to review them for revision from time to time. But do write them down. Share them with your teams. Gather their reactions, their feedback, their interpretations. Consider them and decide how your goals could be revised to be more clear, so they can be adopted by everyone and folded into their outlook and work planning. A quick survey tells me that of the organizations using MyObjectives, just under 10 goals is the norm. Look for a future article on what areas those goals generally fall in to, because understanding that aspect of goals in business will be another step in the right direction. 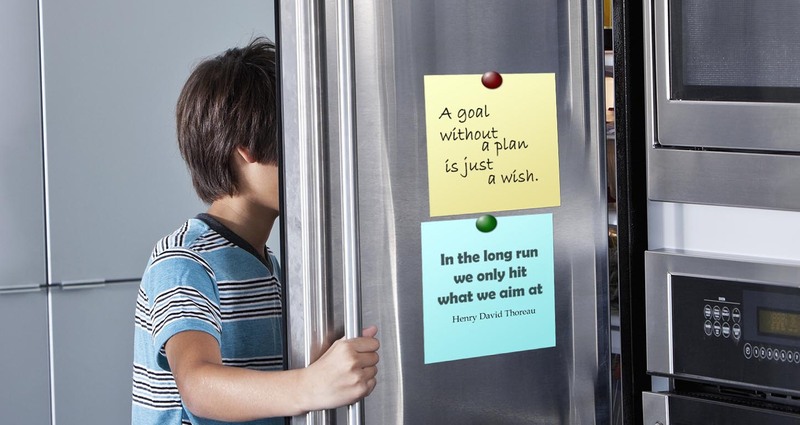 Just know that if your goals can fit onto refrigerator sticky notes in your break room, every employee over the age of 10 will be able to see what they should aim at.